There are eight million stories in the naked city. This has been one of them. Thus, went the famous line delivered at the conclusion of each episode of the late 1950s police drama, The Naked City. Like the aforementioned undressed metropolis, rowing has many tales, anecdotes and yarns. This is one of them. 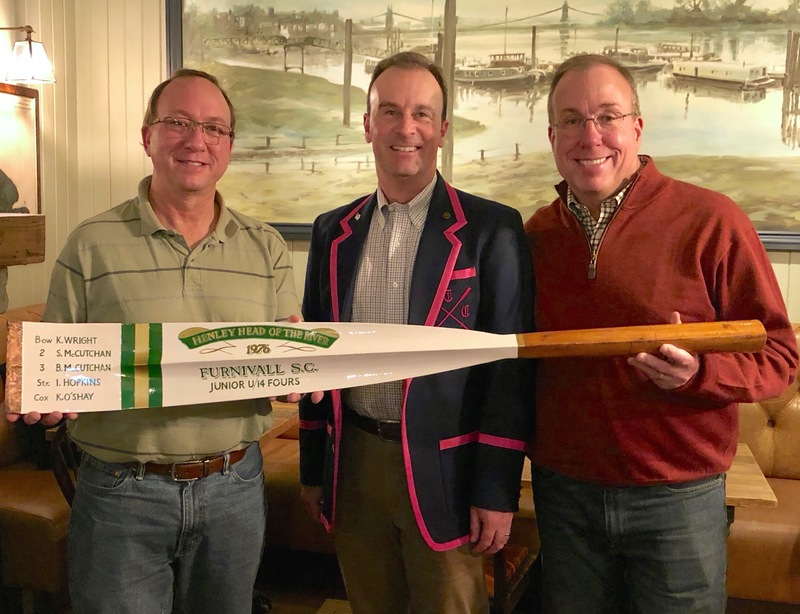 While, in many ways, it is a story that is only significant to those directly involved, it is reproduced here because it is a nice example of the incalculable number of little incidents, each of which shows what a special sport rowing is. Of those who take up serious rowing in their youth, few make it a lifelong involvement – however much they enjoy it at the time. For many people attempting to build or maintain careers and relationships, the sport is either too physically inaccessible and/or too demanding of time and effort to continue much after formal education ends and proper ‘grown-up’ life begins. 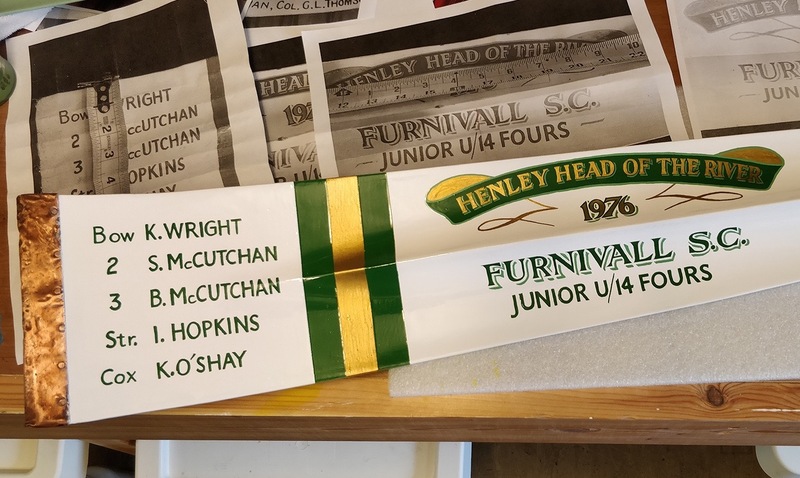 All that these legions of ex-rowers often have left are many fond memories and a few precious souvenirs – as in the case of the McCutchan brothers. (My) brother Brian and I were members at Furnivall Sculling Club [in Hammersmith, West London] many, many years ago – in 1976, in fact. We both were youths, obviously… and American, unusually. Our father was a diplomat, and we lived nearby [on Rivercourt Road]. 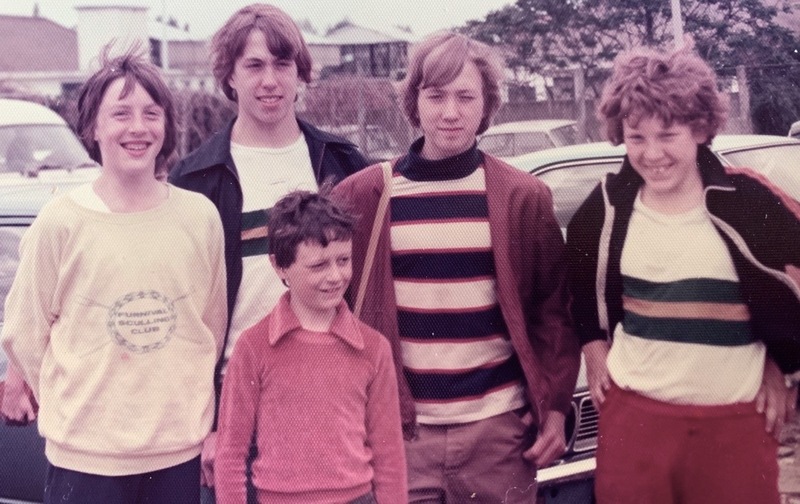 The victorious Furnivall Junior Crew of 1976. Left to right: Ian Hopkins (stroke), Stuart McCutchan, Kevin O’Shay (cox), Brian McCutchan, Kevin Wright (bow). Brian, Jonny, Stuart and the new oar. As with many quickly made plans, it started to unravel almost immediately! Due to a small oversight, Brian’s family were flying from Europe into Stansted Airport and not Heathrow as originally thought… With the assistance of text messages from the family of the still blissfully unaware Brian, it was decided to ‘ambush’ him at dinner which was booked at the Old Ship, not far upstream [from Furnivall Sculling Club]…. Poor Brian was completely stunned! So much so that he didn’t really question Stuart’s decision to be in London to surprise him, nor did he notice the large box under my arm. Soon inside the pub, and still armed with the element of surprise, Stuart said that he had something to present and out of the box came the new oar. Needless to say, a wonderful dinner was had with many stories about the old days. After dinner I left the family still bubbling with excitement. Thank you, Stuart and Jonny, for a nice story. I can add that, your stroke, Ian Hopkins (son of Tideway stalwart, Jimmy Hopkins) continued in rowing and had a distinguished career. However, perhaps Ian is best remembered for what he did not do. He reached seven (I think) Henley finals – but he never won (though it’s still a lot more than most of us have ever done).